As predicted in my last post, I have another pumpkin recipe for you. 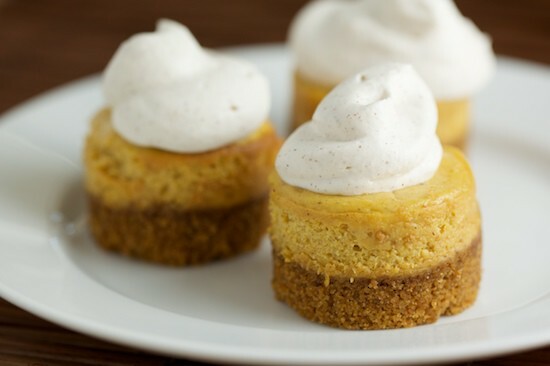 This is the second mini cheesecake recipe on this site and each time I use my mini cheesecake pan, I love it even more. It’s easy to use, easy to clean and I’ve had perfect results each time. The best part about baking mini cheesecakes rather than a full-size cake is that you don’t have to worry about slicing it. I swear I must be the world’s worst dessert slicer. It doesn’t matter whether it’s pie, cake or cheesecake, the slices always turn out horrible! Now I’m starting to understand the recent popularity of cupcakes, they look cute and perfect with no slicing involved. 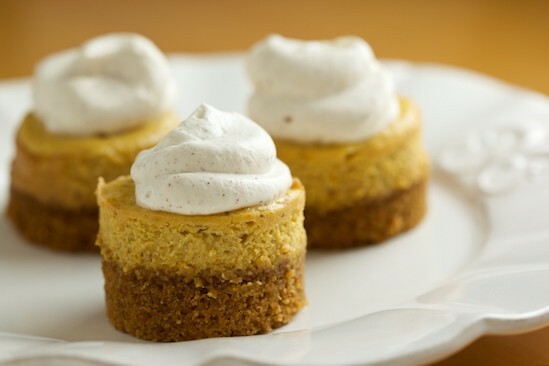 As I was looking around for a pumpkin cheesecake recipe, I saw that one of them was topped with cinnamon whipped cream. I ended up making up my own cheesecake recipe rather than using any of the ones I found, but the idea for cinnamon whipped cream stuck in my head. I always whip my own cream but I had never thought of adding spices to it. When it came time to serve the cheesecakes, I decided to try adding a little ground cinnamon along with the usual vanilla and powdered sugar, and it turned out to be the perfect topping for these cheesecakes. It will also be my new favorite topping for any pumpkin or apple pie from now on! If you’ve never seen a mini cheesecake pan before, this is what it looks like. The bottom of each well is covered with a removable disk that can be pushed up through the hole in the bottom. This makes the cheesecakes easy to remove once they are baked. Making the cheesecakes is simple. 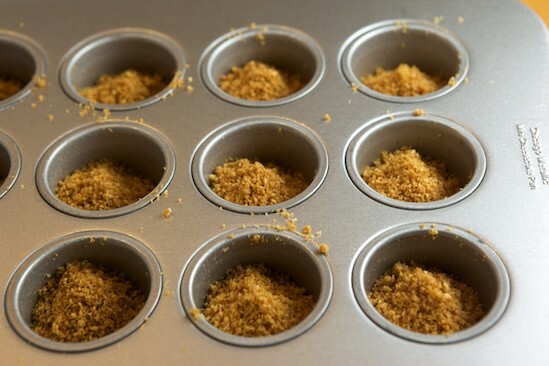 Mix up the graham cracker crust ingredients and divide the crumbs evenly between the cups. 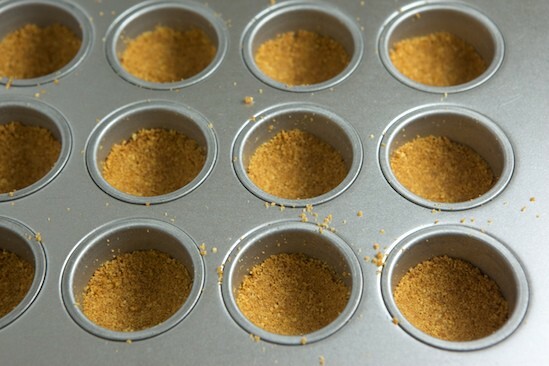 To press the crumbs in to form the crust, I like to use the bottom of a tablespoon. But you can also just press them in with your fingertips. Next, mix up the filling ingredients and divide the batter between the cups. I use a cookie scoop. Bake the cheesecakes in a 375 degree oven for about 14 minutes. They shouldn’t crack like this, but for some reason mine did today. Oooops! If it happens to you, don’t panic! They’ll look better after they cool. See? Just let them cool in the pan for about 20 minutes and they will shrink down and the cracks won’t be as noticeable. When you’re ready to remove them, just push your finger up through the bottom, or use the handle of a wooden spoon. The cheesecakes should pop right out. Let them cool completely on a wire rack then refrigerate until ready to serve. Just before serving, whip up some cinnamon cream and add a dollop to the top of each cheesecake. You can change up the amount and type of spices in this recipe to suit your own taste. If you have pumpkin pie spice on hand, you can just use that to replace all of the other spices. 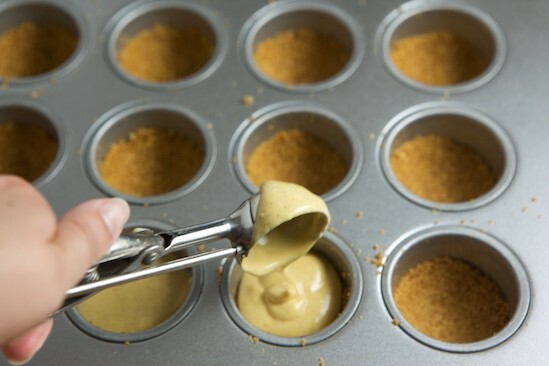 If you want to experiment with the spices but don't like the idea of tasting the batter with raw egg, blend together everything except the egg and keep adding spices and tasting until you get the flavor you want. Then add the egg and continue with the recipe. IT is THanksgiving here in Canada nextweekend and youhave just answered my question about what to have for dessert. I wanted something different than the usual pumpkin pie. Could they be made in muffin tins do you think. I am not sure what mini cheesecake pans are but I know I don't have any. I frequently add maple syrup to my whipped cream, it's really nice too. I need to get some of those mini cheesecake pans, I also suffer from your slicing difficulties disease, plus they're just super cute. I know exactly what you mean about slicing things poorly! it makes me stick my tail between my legs and whimper away from photographing foods i have to cut! i've always been so envious of people like keiko from nordljus who seem to get the cut right every time. Now as far as the pumpkin cheesecakes are concerned! OH HECK YEAH! I'm the first to admit that i'm a cheesecake purist. I don't like all those flavored cheesecakes (for the most part) but there is something about pumpkin cheesecake that just works. and my do these little ones have my psyched! These are great! I like cheesecake a lot and pumpkin... I will try them soon. Ciao. Cinnamon whipped cream would be good on pumpkin pie, too! I love the fall and last year I made many pumpkin cheese cakes. I made mini cheese cakes but like most I dont have many mini cheesecake pans so I bought the pre made mini gram cracker shells, You get 6 for $1.99 or so. If your making the cakes for a small gathering it wouldnt be so bad just to buy them. But I cant wait to try this recipie out! I adore my mini cheesecake pan, too. Not only does it eliminate the slicing issue, but also those little cheesecakes are just too cute. It makes it easy to have some variety, too. I must say this recepie looks great. But as a scandinav I'm not used to american measurements. So how much is 1/3 stick of butter? Cant wait to try this cheescake. If I was to make this in a normal cake tin - how lage would you estimate the tin to be? Thank you! I like this website because it is about one person expressing their thougts... and we know that a picture is worth a thousand words. Nice work. A whole stick of butter is equivalent to one cup or 8 fluid ounces. So a 1/3 stick of butter is roughly 3 fluid ounces, or about 80 to 85 mililiters.I've got to try this recipe for thanksgiving this year. Thanks very much for posting it! I don't have a mini cheesecake pan, is there anything else I can substitute? Would a normal cheesecake pan work? I'm not a huge fan of pumpkin cake in general, but those look ridiculously delicious. Very nice. Mmmm! These look amazing. 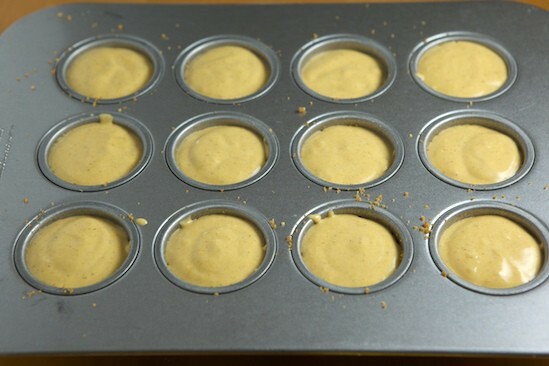 I might have to go out and buy a mini cheesecake pan for the sole purpose of making them. Thanks for sharing! That sounds amazing. I'll have to try this out myself! I love adding flavours to whipped cream. Cinnamon has been a longtime favourite, as is maple syrup. I also add cocoa powder for chocolate whipped cream and nutmeg for coffee flavoured desserts. Really, your imagination is the limit. Look at those delicious looking cakes! What a great color! 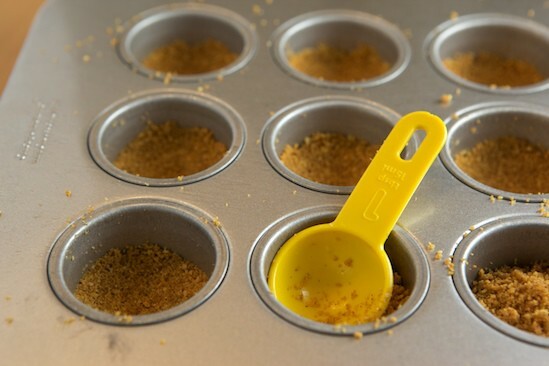 What mini cheesecake pan did you use, the Chicago Metallic or the Norpro (which is non-stick)? Does it matter? Have you tried both pans? Thanks for the recipes, they were great jumping off points. I made the original with the cherries, it looked exactly like your pictures, and were delicious. I just made a batch of the Pumpkin and they turned out great. I had to fudge the recipe a bit, but the batter tasted great, so I know chilled, with some whip cream and they'll be great. I have used the foil liners in a standard muffin pan and the the taste was good, but presentation was lacking. Although those eating didn't mind, because I made those with Oreo crust. Just like muffins, you get that nice layer that's going to stick to the paper. I've got the Norpro (dark finish) mini-cheesecake pan and after cooking the first batch I found turning oven down to 350 F and cooking an extra minute or so helps them not raise as much. Aaron, since I'm not a 'fudger' and need to know EXACT ingredients, what did you have to change on the recipe and for what reason? I haven't made these yet. Thanks. What a cute and delicious idea!! I have the same mini cheesecake pan and I think it's high time I put it back into the rotation. :) I love the idea of the cinnamon whipped cream, too! These are absolutely beautiful! 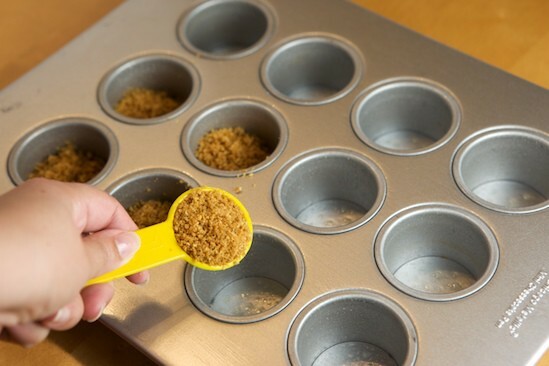 I have to get one of those pans, I keep seeing wonderful mini cheesecakes everywhere. Yum! Beautiful cheesecakes and always magnificent photos!A small amount of cornstarch and baking at a lower oven temp will keep the egg protein from overcoagulating (and causing cracks). I've gotta get one of those pans. These look adorable and that cinnamon cream is the perfect finishing touch. These are absolutely adorable! Wow! Boy, do these ever look good. I've been meaning to get one of those pans for a really long time now. I think I have just been convinced to get one sooner rather than later! bite size! dangerous to have bite-size around my little chubby fingers. seriously though, these look amazing and oh so easy. nice. ohh my goshh! these look to die for! I couldn't afford a "mini-cheesecake pan", or wait the week it would take to arrive from amazon; but my mini-muffin pan worked well. I inverted the pan after the cheesecakes cooled and they released perfectly. A delicious recipe. I loved the cinnamon and maple syrup in the crust, and the cinnamon whipped cream was so special. I'm going to top my hot chocolate with it! I think that cooking times will need to be adjusted per the size of the mold people choose to use. Your photo is lovely too. I made this for a dinner party and they were GREAT. I used 1/2 a cup of grounded ginger snap cookies and 1/2 of graham, and garnished with a bit of creme fraiche and sprinkled with cinnamon. The creme fraiche was a nice contrast to the sweetness and the spice. the filling was soooo creamy and smooth, and even better 2 days after baking, like most cheesecakes. I LOVE my mini cheesecake pan and am looking for more recipes as i have a huge get together around Christmas and I want to make those in advance and freeze... so keep'em coming!! Absolutely delicious! Used the mini muffin tin, as I didn't have a mini cheesecake pan. Ended up with 24 vs. 12. Really wonderful recipe. Thank you for sharing it. I'm glad I found your site, and I must say I love the site name - "pinch my salt." Very cute. Thanks again! These look great! Next time you make cheesecake, make sure to cook the cake in a water bath (this will prevent the cracking at the top). 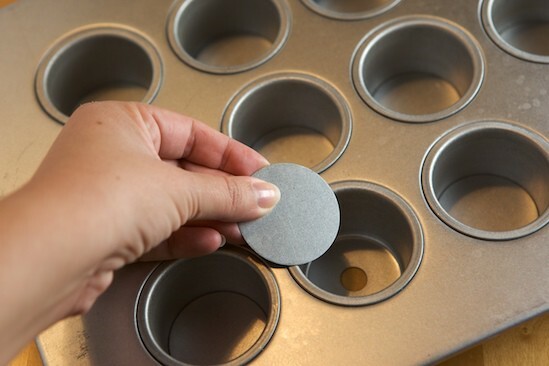 Line the muffin or cake pan with foil and place onto a sheet pan. Pour water onto the sheet until it covers about 1/4 inch of the cake pan. This will make your cheesecakes look beautiful everytime! Why do I know this? I go to culinary school for baking and pastry..lol. Thanks! 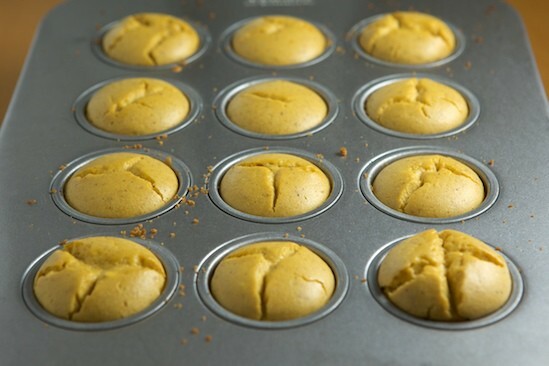 I made these in a regular muffin pan with fresh pumpkin this Thanksgiving and they turned out perfect and delicious! By Friday evening they were all gone! After taking them out of the oven, I gently loosened the sides, let them cool for 20 minutes, and gently lifted them out onto a serving plate with no problems. I will definitely make these again and really enjoy your website. Thanks for a great Thanksgiving dessert that was also very easy to prepare! Also, Alicia from South Texas, when using the muffin pan, do not use the liners. They come out better on their own. From Ruth from South Texas! Wow, they look like candy corn. I'm thinking about making them for my family christmas get together. I'll make sure to have the whipped cream so they really do look like candy corns. Thanks for sharing! 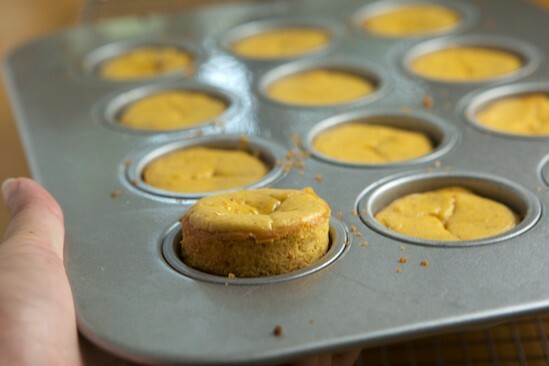 I just recently got a mini cheesecake pan + I haven't been able to put pumpkin cheesecake out of my head.Making this recipe this weekend, for sure. Thanks for sharing! Nevertheless given that this post is subject to surprising spurts of vandalism during certain times of day, administrators should semi-protect it for brief cycles in most instances. omgosh these are so darn cute! and where on earth did you find the cheesecake pan? i am going to need one as cheesecake is one of the most common desserts in our home. the recipe sounds great and the images are awesome! these are perfectly gorgeous! i love your "how to"! 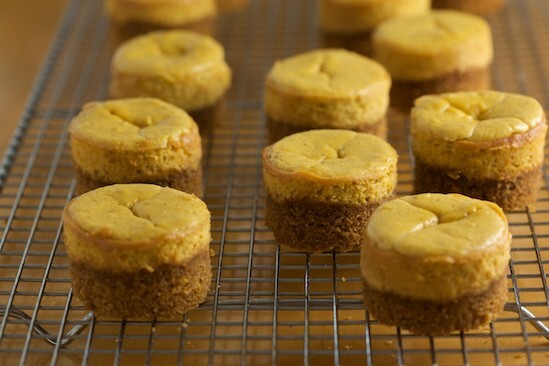 How many mini cheesecakes does this recipe make, just 12? I need at least 24 so I need to know if I should plan on doubling the recipe. thanks! I made these mini cheesecakes for my boyfriend to take to a work party of his. When he came home (empty handed i might add) he said everyone raved about them and multiple people asked for the recipe. A coworker invited us to a Superbowl party and asked us to bring dessert. I was thinking brownies or cupcakes but my boyfriend insisted that i make these again. This recipe is a winner! What's Happening i'm new to this, I stumbled upon this I've discovered It absolutely useful and it has aided me out loads. I am hoping to give a contribution & assist other customers like its aided me. Great job. It really is acceptable the perfect time to have the strategies with the long term and it's really time for it to feel special. We've find out the following submit and when I really could I must propose people several intriguing problems or guidelines. You may can create subsequent articles or blog posts about it document. I would like to discover more concerns roughly the idea! Hi! Plan to make these for thanksgiving, and am also making other pies, so just wanted to know how far in advance you think they could be made and refrigerated. Thanks!